The Haslemere Peasant Industries was set up by Blount and his wife Ethel, c1896, as an artistic community with the aim of integrating work, leisure and the country life and the philanthropic principles of the home industries movement. The society promoted traditional country crafts and encouraged work for love and not money. It rejected mass production in preference of independent craft workshops and weaving houses. It acted as an umbrella organisation of small workshops that employed local craftworkers. It also ran a shop in London. Along with C.R.Ashbees wife Janet, Godfrey and his wife Ethel were prominent members of the Healthy and Artistic Dress Union (1890), which promoted the wearing of “unusually comfortable, loose-fitting clothes made of hand-woven cloth”. 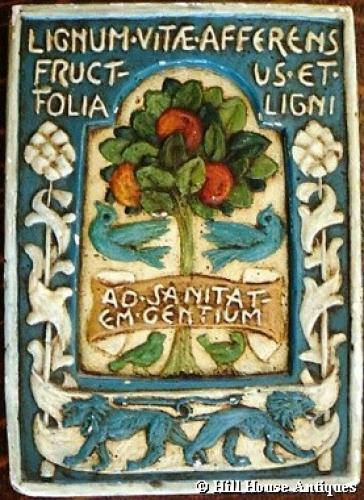 The tablet, beautifully decorated in a naieve style with birds in flight around a tree of life; reminiscent of the designs of Baillie-Scott and CFA Voysey, is inscribed, “ Lignum vitæ, afferens fructus folia ligni ad sanitatem gentium” which comes from the fuller quotation, "In medio plateæ ejus, et ex utraque parte fluminis, lignum vitæ, afferens fructus duodecim per menses singulos, reddens fructum suum et folia ligni ad sanitatem gentium". (In the midst of the street of it, and on either side of the river, was there the tree of life, which bare twelve manner of fruits, and yielded her fruit every month: and the leaves of the tree were for the healing of the nations); from the Book of Revelation, 22:2. Printed label verso; “The New Crusade Welfare Talisman from the John Ruskin School Haslemere” and dated inscription Feb 11th (19) 25. The Blounts had also established a large workshop there called the St. Cross School of Handicraft, which produced childrens toys. The John Ruskin School, also run by Blount, amongst other decorative objects, produced hand printed ‘Welfare Talismans.’ These were coloured religious pictures that were often used as Christmas and Easter cards. Visitors came from all over the world to visit the Blounts studios. A linen textile panel with similar design of birds in flight and tree of life by Godfrey Blount, is held in the collection of the Victoria & Albert Museum in London. Ref: “The Lost Arts of Europe”: The Haslemere Museum collection of European Peasant Art - A collection of essays edited by David Crowley and Lou Taylor, 2000.